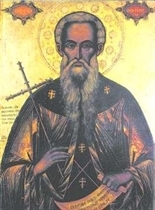 On 19 October the Bulgarian Church celebrates the discovery of the imperishable holy remains of St. John of Rila (a.k.a. Sveti Ivan Rilski) and also their moving to Sofia. When the Hungarians led by their king Bella III conquered Sofia in 1183 they took the holy remains of St. John with them and carried them to their capital Estregon in order to receive the protection of the saint. Later the holy remains were taken back to Sofia by the Hungarian king who also sent a lot of gifts along with them and in 1195 the Bulgarian tzar Asen I conveyed the remains from Sofia to Veliko Tarnovo. On 30 June 1469 the holy remains of the saint were taken back from Veliko Tarnovo to the Rila Monastery where they are treasured even today. The monastery is not only famous as the place where the saint has once lived but also as the place which has preserved the holy remains of its founder. Nowadays the monastery is a testimony for the holiness of the saint?s life and for his presence in the lives of the believers in Bulgaria. That is why on 19 October the Rila Monastery celebrates. It celebrates the fact that it has been a holy place because of its founder - St. John of Rila.